I don't know for sure that my mother had anything against turnips, but for some reason, she never fixed them. My guess is that her mother made her eat them too many times during the Depression and did not want to be reminded of those tough times. Since turnips are not a mainstream-vegetable, and given my lack of familiarity with them, I never prepared turnips for my family, either. Several years ago, while shopping for garden supplies, I saw huge packages of turnips seeds for sale at the local MFA, (Missouri Farmers Association). Not only did some of the packages contain hundreds of seeds, but this was late in the growing season...the time of year when most gardeners are tired of planting, picking and processing vegetables. I held up one of the hefty packages and wondered who would buy them. My next thought was that maybe this was a great vegetable after all so I bought a small package of seeds. Planting was easy and in a short time bright green leaves and purplish tops indicated that all sizes of turnips were growing in my garden. Since this is a root vegetable, most of their essence is not visible until pulled out of the ground. 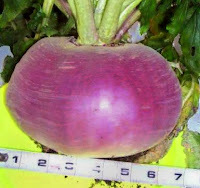 The largest turnip I grew turned out to be over 6 inches in diameter (pictured below)! Over time, I learned two simple ways to cook and enjoy turnips. Today's recipe was suggested to me by a man who cleaned out our chimneys. Before he left, I gave him a bag of turnips and he told me how his family had always fixed them. You can serve this as a side dish or increase the quantity and enjoy it as part of a comforting, vegetarian meal loaded with vitamin C. It is delicious. ﻿Select a nice-sized turnip. Peel off the skin and slice the flesh into 1/4-inch strips. Put an inch of water in a small pot and add turnip strips. Simmer, covered, until tender. Meanwhile put 2-3 medium-sized, cut up red potatoes in a pot. Cover with with water and boil gently, covered, until soft. Drain water from turnips and from tender potatoes. 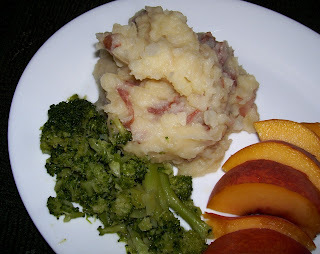 Add turnips to potatoes, mix in 3-4 tablespoons of margarine or butter, mash and mix well. Salt if desired. Beat mixture until fluffy. Serve immediately.